If you have any questions about the Nollning 2012 do not hesitate to contact us. 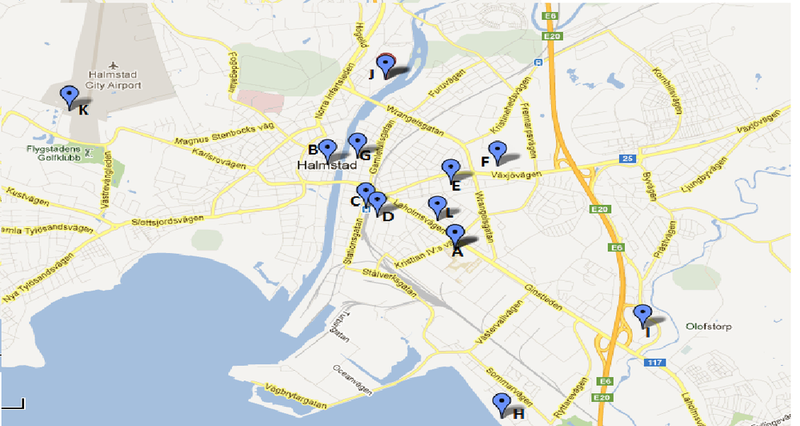 B - Halmstad innerstad (Town center) - In the town center you find the shops, cafés, pubs and the liqour. C - Tåg station (Train station) - From here you can catch a train to Gothenburg or Malmö and Copenhagen. E - Krusbäret (dorm) - Student rooms - quite cheap and the most of xchange students live there. F - Arenan (Sport court) - A place for those who like sports. H - Östra stranden (dorm and beach) - A nice place to hang around in the summer with a big beach to relax on. J - Örjans vall (Football stadium) - This is where Halmstad BK and IS Halmia plays their games in football. Welcome to Halmstad! This is our blog where we'll post some fun stuff about Halmstad, University, Sweden and the Nollning. Here you'll also get important information about the city and how it is to live in Sweden and what you might expect.